The Warehouse in Castile Square is an installation belonging to the Canal de Isabel II. He is placed, from 1952 at the end of the walk of the Castilian one in the municipal area of the one that was the fourth warehouse of the Plaza of Castile (constructed in the year 1939), and with a capacity of 180.000 m3. In the year 1952 it was relieved by the warehouse of the square of Castile. At the beginning of the 21st century a remodeling was done in the zone. They find also in the square a public park (the park of the Channel of Isabel II) and a center of temporary exhibitions. They are the recent new use that has been given to the former areas and facilities of the Channel of Isabel II. The high warehouse has remained as singular construction. Another building placed in the square is that of the Courts of The First Instance, Penal and Instruction, the biggest judicial building of Madrid. Here we have it. And now let’s be going to see, to finish, to Four Torres Business Area (CTBA). It is a managerial park placed together with the Walk of the Castilian one, in the neighborhood of La Paz, constructed on the areas that before shaped the Sports City of Royal Madrid. 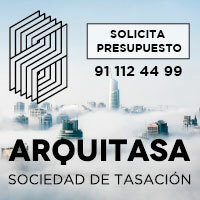 Known initially as Madrid Sand, the owners’ consortium of four towers decided to adopt a new corporate image and Business Area changed his name to that of Four Towers. It has four skyscrapers that are the highest buildings of Madrid and of Spain. They are in one of the highest zones, with what they give a major effect of grandeur before other skyscrapers, when the difference of height of the buildings is not so big. They are the Tower Cepsa (called previously Tower Bankia and Tower Repsol), the Tower PwC, the Tower of Crystal and the Tower I Spread. His construction began in the year 2004. 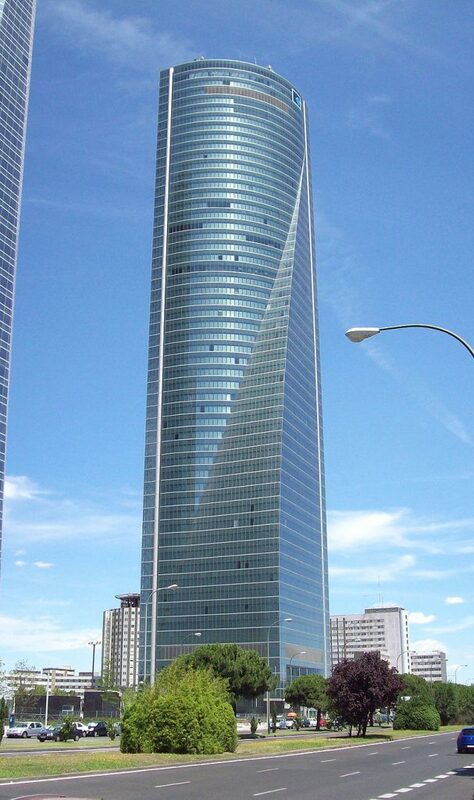 The Tower of Crystal is the highest of Madrid and Spain with 249 meters and 52 floors. The architect is the Argentinian César Pelli.. The most important of this building they are the reflections of the crystals. It possesses a garden in his top part of 600 square meters. It shelters offices of companies like KPMG, Havas Media, Volkswagen, Coca Cola, and has a gymnasium and two restaurants in the interior. In January, 2008, two fans of the jump base they managed to infiltrate into the works of the Tower of Crystal and, after rising up to the highest part, to be thrown from a height near to 250 m. Opening a parachute after five seconds of free fall. The images were spread for anonymous and published by the mass media. The Tower Space finished at the end of 2007, the Tower of Crystal at the beginning of 2008, the Tower Cepsa in the middle of 2008 and the Tower PwC at the end of 2009. They all shelter offices, though the Tower PwC shelters also a hotel and in the highest part of the Tower of Crystal there is a garden. Every building has several underground floors of parkings and, also underground, accesses by road to the managerial park. They represent the most modern and futurist part of Madrid.